How is it some people always get insider hook-ups on Fun Things to Do? Get deals in your inbox. Don't worry, we hate spam too! you can unsubscribe at any time. Connect With Thousands of Local Fun Seekers Searching For a Fun Business Like Yours. Each month thousands of active people search FunJunkie.com to find fun things to do in their local city. Many popular Google searches like “Date Ideas Austin” or “Unique Things to do in San Antonio” also feature FunJunkie.com prominently in the results. Are you looking for restaurant advertising or a similar entertainment oriented business that really works? Look no further. Try It Now For 30 Days Absolutely Free! We are so confident that you will love advertising with us that we’ll create your custom ad and run it the first 30 days for free! No Credit Card required. No obligation. Quit anytime. Increase Your Business. 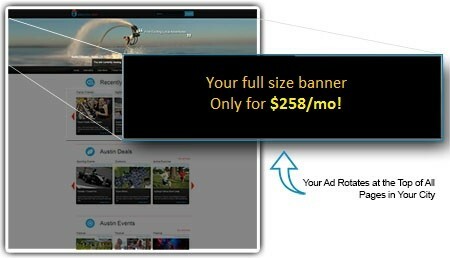 Advertise for Less on FunJunkie.com. Is your business fun? If so, it’s just what thousands of our visitors are looking for. Advertising on FunJunkie.com is a great value. Starting at only $29 per month it costs only a fraction of what you would spend to advertise on sites like Yelp, or Citysearch. And unlike those other sites, our users are only looking for fun. You won’t find any Dentists or Auto Repair ads on FunJunkie.com. So your advertising is actually reaching your target customers. And unlike advertising on sites like Groupon, there is no need to deeply discount your services to attract our readers. Our users are looking for fun! Will they find you? Monthly Reports That Show Your Results. Every month we send you a summary report showing total user views, clicks to read more about your business, visits to your own website from FunJunkie.com, and new user likes. We can even track the phone calls to your business if you want. Your listing on FunJunkie.com adds a valuable backlink to your website to increase your SEO and website rankings in Google. Try It Free! Quit Anytime. Money Back Guarantee. If you are ever unhappy for any reason, cancel at any time and we will happily refund the previous 30 days. Have questions? Call us at 855-Mktg-Pros (855-658-4776) or email us [email protected]. Ready to Get More Business? Start Your Free Trial Today! No Credit Card Required. Are you the decisive type? Are you ready to get your phone ringing and your front door swinging? Select your ad choices below, and we will have your advertising up within 5 days. Your phone could be ringing later this week! Our rates are purposely low to make advertising cost effective & build long term relationships with our advertisers. For most of our advertisers, a single new customer will pay for their monthly ad cost. 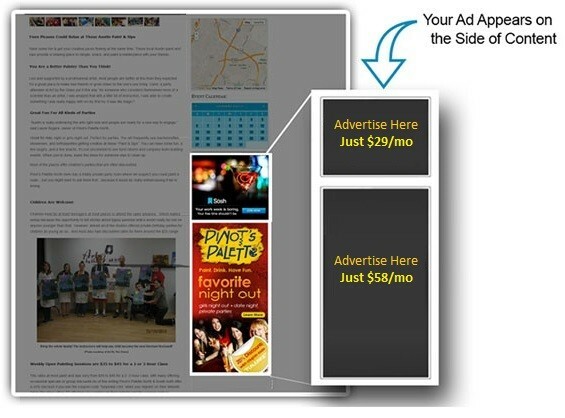 See our advertising options below starting as low as $29 per month. Place your ad next to our content and be seen by hundreds of people every day. All our ads are local fun things to do, so our readers value them. Want even more interest? Offer a discount in your ad to give readers that last bit of motivation to choose you. The FunJunkie community is looking places to have fun. Why not your place? Try it Free. No Questions Refund if you’re not completely satisfied. Do you want the most possible exposure? Businesses featured in our header graphic get the most views. Since it doesn’t look like an ad, people are less likely to get “banner blindness” and skip past it. Our headers always look fun, and they are always relevant to our fun-seeking users. You will never see product ads for cars or cell phones in our header graphics, only cool looking fun things to do. It’s a great way to make a lasting impression on future visitors to your fun business. All the prices quoted above are based on automatic monthly payments via credit card or PayPal. Quit anytime. All submissions are subject to approval. Non-qualifying submissions will be immediately refunded. The basic guidelines are that your business must be entertaining and legitimate.